Donald Trump has been in charge of the U.S. for many months now and by now the novelty is beginning to somewhat wear off… one tweet at the time. Though in reality, Trump is still as unaccustomed to the job now as he was at the very beginning of his tenure. Alas, rather than continue Obama’s withdrawal strategy, the “draw-down of U.S. forces from Afghanistan – known as the retrograde – [that was supposed] to be completed by the end of 2014,” the businessman-turned-president has now come to the conclusion that the fighting must go on until an “honorable and enduring outcome worthy of the tremendous sacrifices that have been made, especially the sacrifices of lives” can be achieved. And so it seems that now the “unconventional” and “unorthodox” U.S. President that is Trump has finally become yet another Leader of the Free World beholden to the infamous “military-industrial complex,” the opinion of people whom he refers to as “my Generals and military experts” and the Deep State, as it is known today. As a result, he is now performing a remarkable U-turn, completely negating his earlier-made pledges and promises, such as the one he made in Fayetteville, N.C., “We will stop racing to topple foreign regimes that we know nothing about, that we shouldn’t be involved with” (6 December 2016). Yet now, Trump appears committed to meddling abroad like any other of his predecessors, starting with the now infamous dispatch by MSNBC’s Brian Williams of “beautiful weapons” into Syria last April and now culminating in his ‘all-new, all-different’ Afghanistan policy that appears to be taking up where Obama left off earlier. Still, U.S. President Trump managed to add something new to the heady mix of American activities and policies in the Hindu Kush, stating bluntly that “Pakistan often gives safe haven to agents of chaos, violence, and terror,” as part of his wider statement regarding the new U.S. policy in Afghanistan. Going into some detail, Trump also added that the U.S. “can no longer be silent about Pakistan’s safe havens for terrorist organizations, the Taliban, and other groups that pose a threat to the region and beyond,” and ending his exposition on the Land of the Pure with the words that “it is time for Pakistan to demonstrate its commitment to civilization, order, and to peace.” Whereas Trump’s newly articulated Afghan policy represents a clear victory for advocates of a continued American imperial policy in the Hindu Kush, his inclusion of Pakistan is a bit of a departure from time honoured U.S. policy. The U.S. Ambassador to Afghanistan under President George W. Bush, Zalmay Khalilzad, said as much talking to ABC’s ‘This Week.’ Literally, Khalilzad declared that he does not think that “either President Bush or President Obama focused as sharply, as clearly . . . [on] Pakistan’s both role as a facilitator of and a help to Afghanistan and as a sanctuary for those who fight us,” going on to indicate that in his view “the single most important factor, the Pakistan problem, for prolonging the war . . . [are] the sanctuary issues.” In fact, it has long been an open secret that the Taliban freely and openly cross the Af-Pak border, as necessitated by circumstances and accommodated by the Haqqani Network (a “veritable arm” of Pakistan’s Inter-Services Intelligence (ISI), according to erstwhile U.S. Central Command chief, Admiral Mike Mullen). While, the roots of the fundamentalist movement itself effectively lie in the northern Pakistan of the early 1990s when Benazir Bhutto headed the nation. At present, the homegrown Pakistani faction of the group, the TTP (or Tehrik-e-Taliban Pakistan, currently led by Maulana Fazlullah) oppose Islamabad and on occasion sow terror and mayhem throughout the Land of the Pure (such as a deadly blast in Lahore on 13 February last). And once again, Trump’s ‘all-new, all-different’ Afghanistan policy appears to be taking up where Obama left off. Observers might be led to conclude that “Trump’s ‘America First’ Base [is] Unhappy with Flip-Flop Afghanistan Speech,” as announced by Breitbart on the same day. Whereas, on Wednesday, 23, August 2007, the Imamia Students Organisation (or ISO, a Shiite Muslim students’ organisation in Pakistan) organised anti-U.S. rallies in the Pakistani cities of Karachi and Lahore – these gatherings even carried the significant heading of ‘Death to America’ – meaning that the world has now somewhat reverted to normal again, with the U.S. vowing to kill certain Muslims and others vocally calling for the demise of the world’s sole super-power. It seems highly appropriate though that these rallies were held by Shiite Muslim, as Trump somewhat erroneously and opportunistically singled out Shiite Iran as the main purveyor of “radical Islamic terrorism” in Saudi Arabia. Pakistan, on the other hand, as the home of erstwhile British India’s Muslims has a Muslim population which is mostly Sunni in orientation and Hanafi in outlook. And the same holds true for Afghanistan and its population. In this way, Trump has now evened out the field inhabited by “radical Islamic terrorists,” targeted by the U.S. military establishment. Arguably, such theological nuances and niceties are beyond Donald Trump’s comprehension or even interest and/or proficiency. One but needs but to remember his words that “all of these experts . . . The experts are terrible!” uttered during last year’s election campaign (4 April 2016). Trump skillfully utilised such anti-intellectual jibes as part of his bid for wide popular and populist appeal. It seems like a mere truism to state that Trump’s ascendancy to the White House is in large part due to his espousal of a “nationalist” or even “nativist” rhetoric during the election campaign, and on Friday, 18 August, the man known as Trump’s “Chief Strategist” mainly responsible for the occurrence of such words in the now-President’s mouth, Steven (or rather Stephen) Bannon, was dismissed from the White House. Bannon had previously been at the head of the right-wing news website Breitbart, affiliated with a movement that has received the media-friendly moniker alt-right. In reality, though, the invasion of the Hindu Kush which led to the volcanic eruption of the now-16 year war bogging down the U.S. was the brainchild of a number of experts during a “4-day [mid-July 2001] Berlin meeting carrying the heading ‘Brainstorming on Afghanistan’ and [that] was apparently the outcome of the Clinton administration’s concerns over Osama bin Laden,” going back to the 1998 attacks on two US embassies in Africa – in Dar es Salaam and Nairobi. 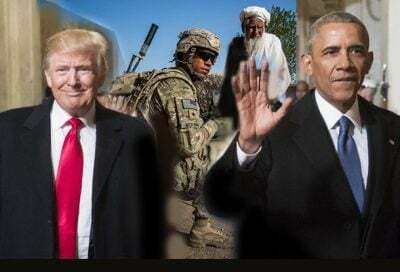 But it was down to 9/11 and George W. Bush to ignite the Afghan powder keg, leading to a conflagration subsequently deftly and somewhat ineptly handled by the Nobel Peace Prize-wielding Barack Obama. Notable: Trump is echoing many of the points Bannon made behind the scenes. But he has gone along w/ a version of McMaster-Mattis plan. As a result, though initially unwilling to do so as his “original instinct was to pull out” of Afghanistan, Trump’s ‘all-new, all-different yet all-the-same’ policy in the Hindu Kush could be seen as part of this claimed commitment to do battle with the enemies of Christianity. At the same time, one could argue that the Billy Graham event was cunningly employed by the Trump team to fire up a significant part of its base to start a number of major military adventures in the Middle East and beyond, using the figleaf of protecting persecuted Christians as a rallying cry to garner domestic and international support. In spite of all of his campaign promises, Donald Trump seems more than determined to follow in his predecessor’s footsteps and become a real war president. And again, these words also first sprung forth from somebody else’s mouth: namely, Barack Obama’s. In early August 2015, President Obama told the members of his National Security Council that “[w]e’re no longer in nation-building mode,” according to an unnamed person present at the meeting. Like Trump just recently, after his inauguration in January 2009, Obama ordered a “quick policy review” of the Afghan situation, but “even before it was completed, he accepted a Pentagon recommendation to send 17,000 additional troops to Afghanistan, bringing the total to nearly 70,000 American troops on the ground,” as worded by the journalist Mark Landler. The mere idea of the U.S. engaging in a nation-building efforts has been anathema to American politicians in the 21st century, with candidate Bush making scathing remarks to Al Gore during the 2000 election campaign. But then, “After 9/11, I changed my mind,” as he wrote in his memoir Decision Points (published on 9 November 2010). Bush elaborated in his memoir that “Afghanistan was the ultimate nation building mission. We had liberated the country from a primitive dictatorship, and we had a moral obligation to leave behind something better.” As a result, in the Hindu Kush an unbroken line of nation-building activities stretches throughout the 21st century, starting in the Bush years throughout the Obama period only to end at the outset of the Trump era . . . for now at least. At present, President Trump is adamant about the fact that the United States will only be engaged in the business of “killing terrorists” in the Hindu Kush – across the Durand Line apparently. But famous or rather infamous for his flip-flopping proficiency, time will tell whether President Trump will be satisfied with sticking to his “original instinct” this time around. Already the rightly-maligned Zbigniew Brzezinki recognised the importance of Central Asia, and Afghanistan’s position at the heart of the region makes abandoning the Hindu Kush a questionable proposition. For starters, there is the Bagram Airfield Base, a permanent U.S. foothold in the mountains, overseeing the country’s underground mineral wealth and keeping a close eye on the Chinese dragon across the border, particularly after the Manas’ Transit Center in neighbouring Kyrgyzstan was closed down in 2014. And the word China has famously been featuring prominently in Trump’s mouth, ever since he started switching career tracks last year. The current nuclear impasse on the Korean peninsula has brought the Middle Kingdom to the fore as well, given the DPRK’s nature as a Chinese client state. Will Trump merely order his ‘generals’ to kill “terrorists” and then stick with his “original instinct” and “pull out” or will strategic and other concerns prevail so that the U.S. presence in the Hindu Kush will continue unabated. In 2011, retired USAF Lt Col Karen Kwiatkowski put it like this: the Pentagon directors like “these military bases [in the Hindu Kush] too well, [they] like the minerals, and [they] like the geographic positioning Afghanistan provides our military.” Will Trump be able to break the dictates of U.S. imperial policy or will he have to succumb like all of his predecessors? Will Trump be the one to end the war initiated by Bill Clinton’s experts in Berlin, or will he merely be able to add another chapter to the ongoing American saga in the Hindu Kush?! ?